A customer brought in this small Aladdin Moonstone glass table lamp the other day and wanted the brass cap reattached and the lamp back to working condition. Initial inspection reveals an old non-polarized lamp cord. All other lamp parts (harp, harp base, socket cap, socket shell, socket interior, and brass collar) seem to be in good working order. The plan for this repair is to repair the brass collar and reattach it to the lamp. 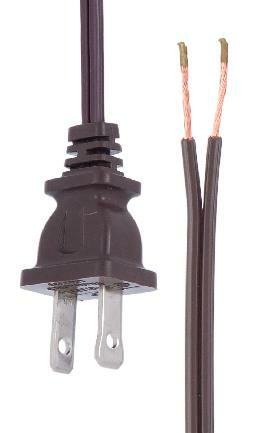 Replace and rewire the lamp with a new lamp cord with UL List polarized plug. The collar will require some epoxy and the plug is an 8 Foot SPT-1 brown cord set. First, we start by disassembling the lamp. The socket shell unsnaps from the socket cap. Be careful when you plan to reuse parts not to damage the socket shell or cap. The old lamp cord unscrews from the socket screw terminals and the cord is pulled out from the bottom of the lamp. With the lamp apart, we will start on the repair. The first thing we want to do is completely remove the brass collar from the socket cap and the harp base. Now we need to clean the old plaster/glue from the brass collar. Using a small carving tool (in this case a Drimmel) we carve out the old adhesive. The brass collar has been restored and ready to be reused. The socket cap, harp base, collar, and threaded rod are put together again. 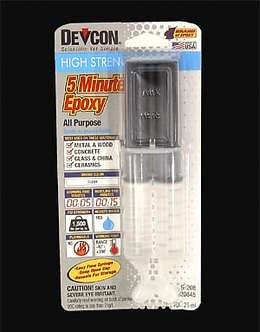 Using our 5 minute epoxy, we pour a dab on a cardboard scrap and mix the parts together. The epoxy is applied to both the collar and the top of the glass lamp body. The collar is placed on the lamp and the harp base is oriented properly on the lamp. We let the epoxy cure. Now we are ready to complete the repair. First, we push the new lamp cord up the lamp body. We tie a UL knot in the lamp cord and attach the cord to the socket interior. The smooth wire connects to the brass screw and the ribbed wire connects to the nickel screw. The cord slack is pulled back down to the base of the lamp body. The push-thru switch is oriented center of the harp base. Slide the socket shell over the socket interior and snap it into the socket cap. Add a bulb and test the lamp.